The Pew Charitable Trusts has named Alexander Sher, assistant professor of physics at UC Santa Cruz, a Pew Scholar in the Biomedical Sciences. Sher will receive a $240,000 award over four years to support his research on how the retina heals itself after laser surgery. Sher applies his background in physics to challenging problems in neurobiology, using custom-designed arrays of microscopic electrodes to probe the simultaneous activity of large numbers of neurons. This system, which he helped develop at the Santa Cruz Institute for Particle Physics (SCIPP) at UC Santa Cruz, has been used in a number of studies, most recently in the development of a new type of retinal prosthesis for restoring sight to the blind and in fundamental research on the neurological basis of color vision. The Pew Scholars Program in the Biomedical Sciences, funded by the Pew Charitable Trusts, identifies and invests in talented researchers in medicine or biomedical sciences. By backing them early in their careers, the program enables promising scientists to take calculated risks and follow unanticipated leads to advance human health. Sher is among 22 innovative young researchers chosen this year from the 134 candidates nominated by invited institutions. He is the fourth UCSC faculty member to receive this prestigious award. Sher began his career studying high-energy particle physics. As a postdoctoral researcher at UC Santa Cruz, working with physicist Alan Litke at SCIPP, he began studying neural networks in the retina. Sher now heads his own research program investigating retinal function and development. The new project funded by his Pew Scholarship will explore how the retina responds to laser photocoagulation. This type of surgery is used to treat a variety of visual disorders, including diabetic retinopathy. Laser photocoagulation can stave off blindness by intentionally reducing metabolic load in the retina through destruction of a portion of retinal neurons. Unfortunately, this long-established treatment can lead to retinal scarring and side effects such as diminished visual clarity and loss of peripheral vision. Researchers have found that treating the eye with shorter pulses of laser light leads to destruction of photoreceptor cells but leaves the processing and output retinal layers intact. The light-sensitive photoreceptors from adjacent areas then shift to fill in the regions in which these cells were destroyed. The process reduces the number of photoreceptors (the treatment's goal), but avoids retinal scarring that might follow more intense conventional laser burns. Sher has determined that the migrating photoreceptors are able to establish functional connections with retinal neurons that had previously been connected to the destroyed photoreceptors. "We showed that healthy photoreceptors move in and connect to the orphaned inner-retinal neurons. This constructive neuroplasticity is not only exciting on a basic science level, it also has implications for treatment," Sher said. Using the novel electrode recording system he helped develop, Sher plans to monitor the simultaneous activity of hundreds of neurons in laser-treated retinal tissue to determine whether the restored circuits are fully functional and able to engage in various forms of visual processing, such as detecting spatial patterns and color. This work could lead to deeper understanding of retinal plasticity and improvements in the treatment of a variety of retinal diseases. Sher is also involved in the development of a new type of retinal prosthesis designed to restore sight to people with diseases such as retinitis pigmentosa and macular degeneration, which cause blindness due to degenerated photoreceptors. 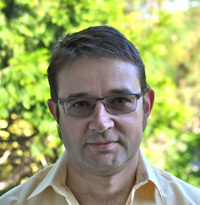 In his lab at UCSC, Sher demonstrated the feasibility of the new prosthesis design, which relies on photovoltaic retinal stimulation and was developed by his collaborators at Stanford University. These results were published May 13 in Nature Photonics. In another recent paper, published May 27 in Nature Neuroscience, Sher presented new findings on color vision. This paper shows that color vision in the retinas of mammals relies on unconventional neural circuitry to discriminate between blue and green colors. This research required reliable observations of an elusive retinal pathway that responds to decreases in the amount of blue light--observations made possible by Sher's multielectrode recording techniques. Launched in 1985, the Pew Scholars Program in the Biomedical Sciences has awarded more than $130 million in funding to over 500 Pew Scholars. The 2012 class of scholars is exploring a range of human health issues from antibiotic-resistant infections to liver disease and cancer.